When you think of a dream school does a school floating in a body of water sounds sort of dreamy? Instead of looking out onto a concrete playground, or a busy street, you would see water in all directions, as your school becomes an island of learning and fun? An architect who comes from Nigeria and works in the Netherlands, Kunle Adeyemi, and his architecture firm, NLE, designed this incredible floating school. Before starting his own firm, architect Adeyemi worked with OMA, a world-famous firm in the Netherlands that is known for some terrific buildings and structures. See more about OMA here. Kunle Adeyemi works as a world architect – he designs all kinds of structures and buildings, for more- and less-developed cities. In 2010 he said, “Although quantitatively different from place to place, the responsibility of achieving these needs at maximum, with minimum means, remains the same globally. I am constantly inspired by solutions we discover in everyday life in the world’s developing cities.” In other words, we can all get ideas and learn from both ends of the spectrum. We need to keep our eyes open and ready for inspiration wherever we live. 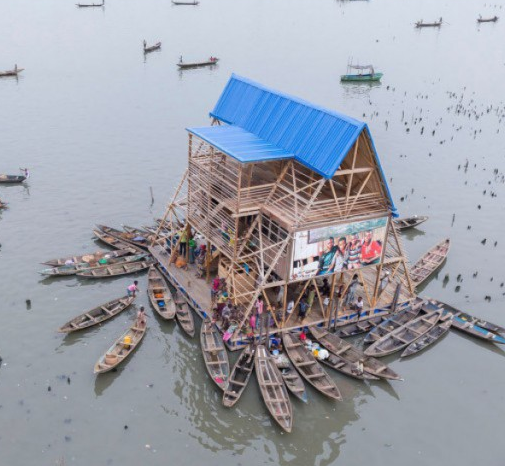 The Makoko Floating School is a beautiful, multilevel structure, in a sort of A-Frame whole. (See how it looks like a letter A – a triangle, really?) It is called a prototype, meaning that the designers are trying this design to see what parts work and what parts need to be improved. One goal of this structure is to build it to respond to the climate change that might otherwise flood the school. In other words, as the water levels increase due to climate change, the school will float on the water, versus getting flooded or destroyed by the rising water levels. The structure also accurately serves the community where it is built in Lagos, Nigeria. The area is a water front community, so people live, work and even shop on boats. It only makes sense to have a school that floats too. See more incredible photos and we thank Iwan Baan for the photo on our site.